A sun poisoning rash or sun rash can occur with exposure to the sun’s ultra violet rays. This type of skin rash is also known as photodermatitis or solar dermatitis. Solar dermatitis rash is often equated to a sunburn and essentially it is the same type of skin problem. Therefore, it is a very common type of skin rash. 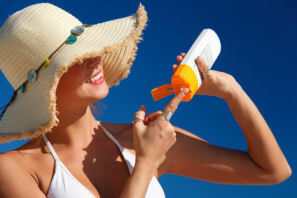 Many individuals can endure sun exposure without major problems unless overexposure occurs. These people may tan or experience skin redness, but will not experience a skin rash with sun exposure. On the other hand, many other individuals have more sensitive skin due to their genetic make up when it comes to sun exposure. People with fair skin such as redheads fall into this category. Certain medications can make the skin more sensitive to developing a sun rash and even products applied to the skin such as lotions, creams, soaps, and various suntan products can cause this skin problem. All of these factors can lead to an individual getting a sun rash. Some consider this skin rash a type of allergic rash or an allergy to the sun. The common symptom of a sun rash is the appearance of small red and itchy bumps on the skin after exposure to the sun. Many small blisters may also be present. The appearance of the skin rash may be evident within minutes of sun exposure or it can take an hour or more. In this form, the photodermatitis is mild and can be treated as you would a mild sunburn. However, in more severe cases, the above symptoms are more intense and other symptoms such as a headache, nausea, chills, fever, and dizziness can accompany the sun poisoning rash. Medical treatment may be required in these more severe cases. For those sensitive to this photodermatitis rash, sun exposure on the skin needs to be limited as much as possible by following some simple rules such as by staying out of the sun, covering up the skin when in the sun, and using the appropriate strength of sunscreen. An individual should also be aware of the medications they are on and whether these medications increase the skin’s sensitivity to the sun and a sun poisoning rash. There are several drugs which possess this characteristic. An effective spf moisturizer is available from Verseo. It helps maintain healthy skin in the face and neck regions and prevent or reduce the appearance of fine lines and wrinkles. This product is known as the Robanda Multi Therapy SPF 25 Moisturizer. Why “Multi Therapy”? The term multi therapy is used because this product is not just a moisturizer. It is a product with a lot more to offer and this is reflected in the ingredients found in this product. For example, this product contains retinol (vitamin a) which can help with acne, skin repair, skin anti-aging, and possibly skin cancer. This Verseo moisturizer also contains many different natural plant extracts such as aloe, rosemary, green tea, sunflower, kava, and more, to moisturize and sooth the skin. Another key ingredient in this moisturizer is alpha lipoic acid, which is a compound that provides strong antioxidant and anti-inflammatory properties. Alpha lipoic acid is an important ingredient to have in effective anti-aging products. Finally, this moisturizer provides spf 25 sun protection, which is essential to prevent premature skin aging. For more information about this product and purchase details please see below.